At one time NYC was one of the most powerful railroads in the nation. 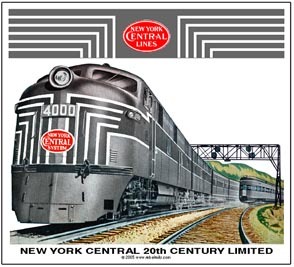 Operating the famous 20th Century Limited Passenger trains, NYC competed with the PRR for decades, then merged (PC) and is now part of NS and CSX railroads. 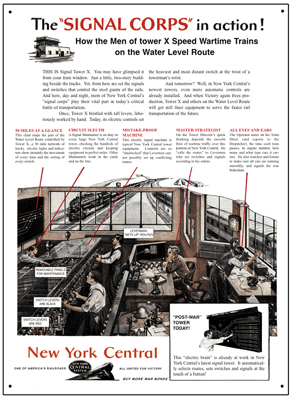 Inside view of the workings and goings on of a Military Troop Train on the New York Central during World War II. Of course this applies to all railroads, as they all carried troops and supplies as required. 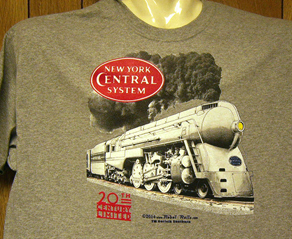 NEW, New York Central 4-6-4 Dreyfus Streamlined Hudson steam locomotive, possibly the most beautiful streamlined locomotive of all time and one of our finest tee designs. Pulled the world famous 20th Century Limited passenger trains. Feel the heat. Reproduction Tin Sign of New York Central Mohawk War Engines ready for duty during World War II. Without the efforts of America's Railroads and automobile industry, we just might still be fighting. A great historic picture into our past. Family looking through the window of their passenger car at family and friends waiting for them at the station. A nostalgic Christmas Homecoming. 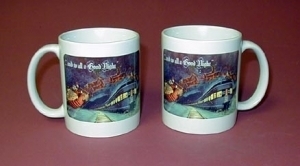 Premium coffee mug featuring the number 999 steam locomotive, the first machine to go over 100 miles per hour. 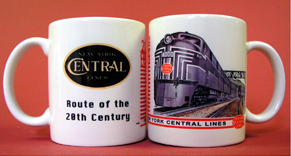 Coffee Mug featuring a New York Central streamlined E-diesel carrying the World famous 20th Century Limited. Beautiful image of New York Centrals 20th Century Limited, loaded with travelers, homeward bound for the Christmas Holidays. A very nostalgic scene indeed. 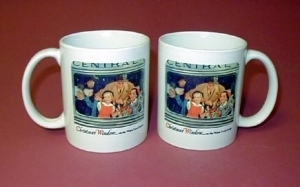 Coffee Mug features the beautiful 4-6-4 Dreyfus streamlined Hudson steam locomotive pulling the equally famous 20th Century Limited flag ship passenger train. 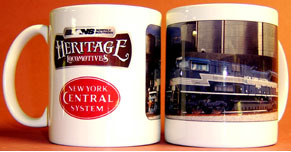 Coffee Mug featuring NYC Railroads logo superimposed over the lightning stripe paint scheme of its diesel locomotives. A very unique way to present the railroads logo. 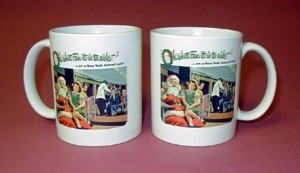 Santa talking to Children on a New York Central passenger car during the Christmas Season, singing O' What Fun It Is To Ride A NYC Train. 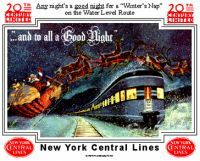 Santa Claus flying over a New York Central Observation car on Christmas Eve. A gorgeous Christmas Mug. 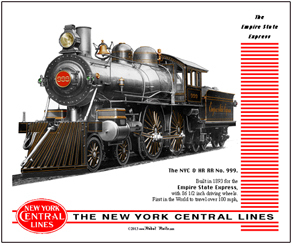 New York Central license plate featuring famous and classic Red NYC LINES logo. 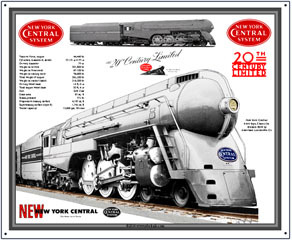 Mouse Pad featuring the sensational streamlined Dreyfus Hudson 4-6-4 steam locomotive pulling the fast and famous 20th Century Limited between New York City and Chicago. Competed with the Pennsy's Broadway Limited streamliner. Mouse Pad featuring the World famous No. 999, first in the world to travel over 100 miles per hour. Built in 1893 for the Empire State Express with 86 1/2 inch driving wheels. Preserved at the Chicago Museum of Science. 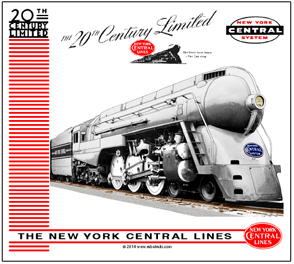 Mouse pad featuring the New York Central Railroads beautiful passenger E-unit diesels in striking lightning stripe livery, heading up the world famous 20th Century Limited between New York City and Chicago. 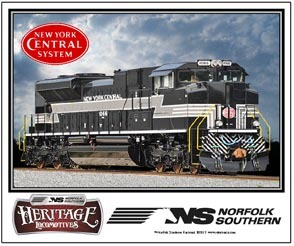 Mouse pad honoring the new New York Central Heritage diesel operated by the Norfolk Southern Railroad. 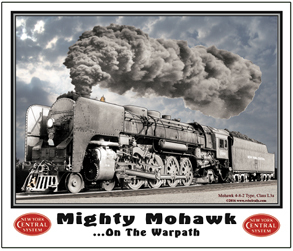 Mouse Pad featuring the Mighty Mohawk 4-8-2 steam locomotive, designed to pull long freights and fast passenger trains. 6 inch x 6 inch square tin 20th Century Limited logo sign of the New York Central System. 6 inch x 6 inch square tin Black & Gold logo sign of the New York Central System. 6 inch x 6 inch square tin cigar band logo sign of the New York Central System. 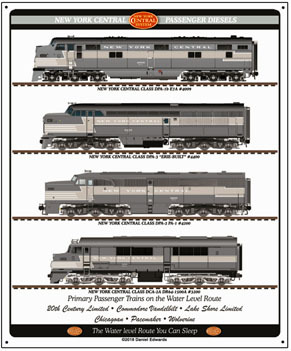 New York Central diesel joins Norfolk Southern Railroads Historic diesel fleet. 6 inch x 6 inch square tin sign of the historic New York Central Heritage diesel. A powerful locomotive paint scheme. 6 inch x 6 inch square tin LAST logo used by the New York Central System. This black logo was used on many diesels, especially on the cab side of switchers and in print advertising. They also used it in red on some of their passenger diesels. 6 inch x 6 inch square tin LAST logo used by the New York Central System. This RED logo was used mostly on passenger diesels. 6 inch x 6 inch square tin Red logo sign of the New York Central Railway. 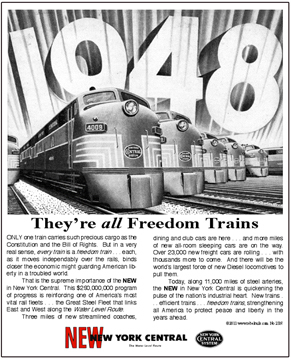 Reproduction of a 1948 advertisement issued by the New York Central System, promoting its new equipment purchased for the after WWII travel boom. 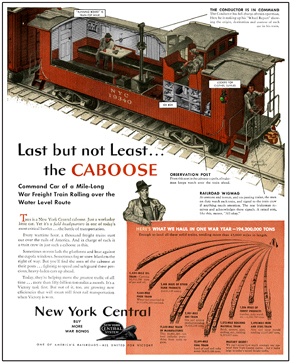 Reproduction of an old New York Central Railroad advertisement promoting its service and describing the caboose and what is was used for. A very interesting tin sign that of course applied to all railroads. Tin Sign New York Central Christmas scene with Santa and his sleigh flying over an Observation car full of folks heading home for the holidays. 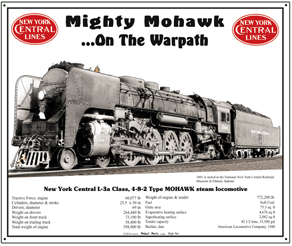 Tin Sign of New York Central Mohawk War Engine with factory specifications. A powerful locomotive with 4-8-2 wheel arrangement, able to pull long freights and fast passenger trains. 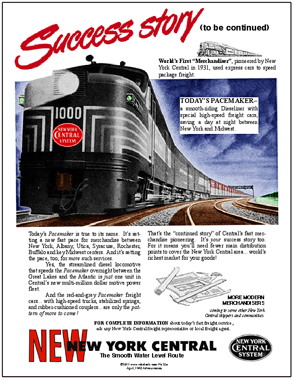 Reproduction of an old New York Central Railroad advertisement promoting the success of its Pacemaker service. A very interesting tin sign. 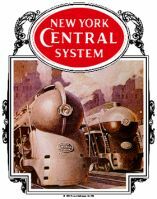 The New York Central Railroads beautiful 4-6-4 streamlined Hudson type steam locomotives were world famous in their day. They pulled the equally world famous 20th Century Limited passenger trains. 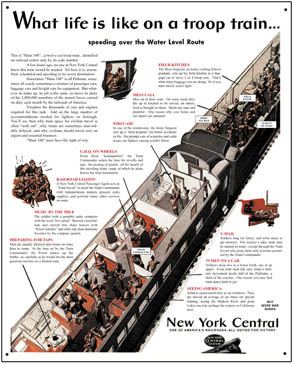 Reproduction of an ad ran by the New York Central during World War II showing the workings of a Dynamometer Car. A very interesting slice of American WWII history. 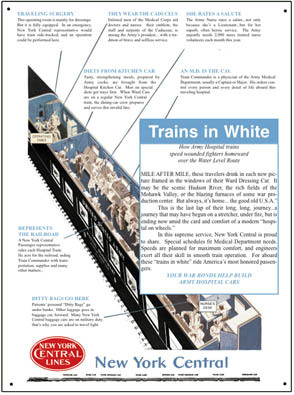 Reproduction of an ad ran by the New York Central during World War II detailing the workings of a Military Hospital Car. A very interesting slice of American WWII history. 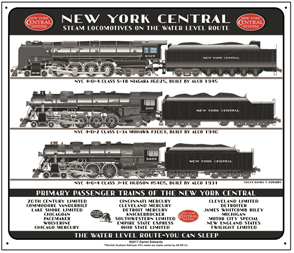 10" x 12" metal sign featuring passenger diesels of the New York Central, including EMD, FM, ALCO and Baldwin. Display this beautiful and informative metal sign in your hobby room for all to see. 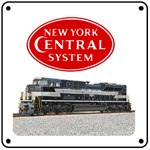 Three of the New York Central Railway's most famous passenger steam locomotives are presented on this metal sign in NYC's industrial black with white trim. 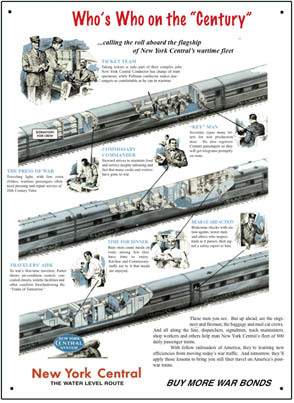 NYC ran the World Famous 20th Century Limited passenger trains. 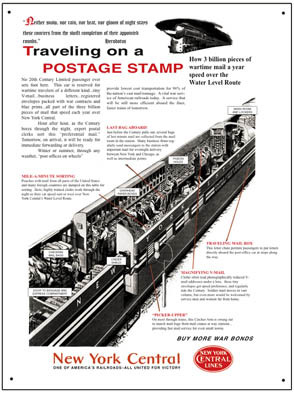 Reproduction of an ad ran by the New York Central during World War II detailing the workings of a Railway Post Office mail car during WWII. A very interesting slice of American WWII history. 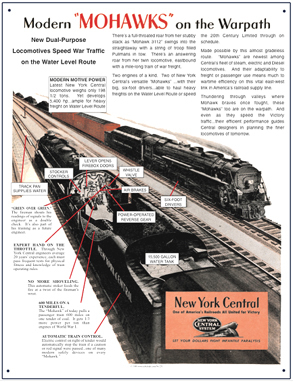 Reproduction of an ad ran by the New York Central during World War II promoting its ability to handle not only the war traffic, but its civilian traffic as well, especially with the new WAR Engines delivered and on order for it's new Steam Fleet! 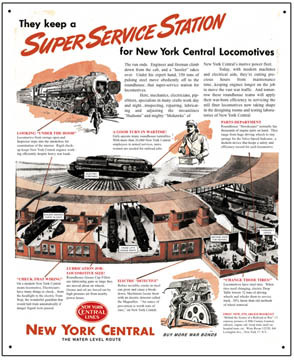 Reproduction of an ad ran by the New York Central during World War II detailing the workings of a locomotive service station, the roundhouse during WWII. A very interesting slice of American WWII history. 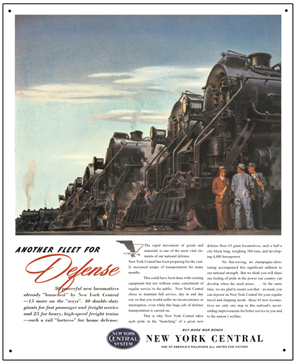 Reproduction of an ad ran by the New York Central showing Who's Who on the 20th Century Limited passenger train during World War II. The Who's are the employees who ran the train and served the passengers. 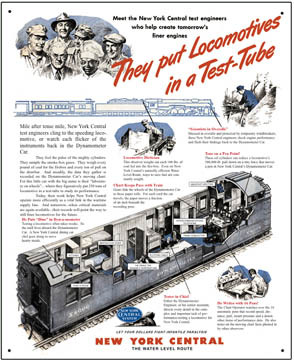 Reproduction of an ad ran by the New York Central during World War II detailing the workings of its Signal Corps for the railroad. Very interesting insight into the workings of a railroad at war. 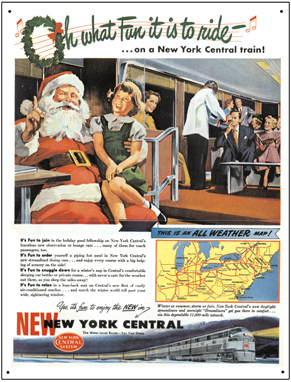 O What Fun It Is To Ride A New York Central Train... a great Christmas advertisement ran by the NYC promoting its Water Level Route to those traveling home for the holidays.